Following the description of the Three Worlds are descriptions of every creature and supernatural force that can be encountered, summoned or discovered in the play of this game. Each description lists the physical, magical and psychological attributes of each creature. They specify the aligned orientation of the creature when it is encountered. As a whole, they precisely place it within the environment of the Three Worlds. 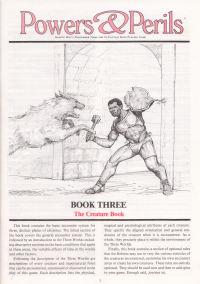 Finally this book contains a section of optional rules that the Referee may use to vary the various statistics of the creatures encountered, customize his own encounter areas or create his won creatures. These rules are entirely optional. They should be used now and then to add spice to your game. Enough said, journey on.